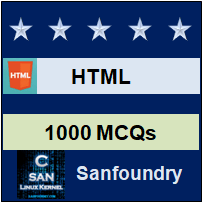 This set of HTML Multiple Choice Questions & Answers (MCQs) focuses on “Web Browsers”. Explanation: A rendering engine is a software that draws text and images on the screen. The engine draws structured text from a document (HTML, XML) and formats it properly based on the given style declarations (CSS, XSL, etc). The primary job of a browser engine is to transform HTML documents and other resources of a web page into an interactive visual representation on a user’s device. 2. Firefox uses _________ rendering engine. Explanation: Gecko is a web browser engine used in many applications developed by Mozilla Foundation and the Mozilla Corporation as well as in many other open source software projects. Gecko is free and open-source software subject to the terms of the Mozilla Public License version 2. 4. What is the use of “defer” attribute? Explanation: The defer attribute is a boolean attribute. The script is executed after the page has finished parsing. The defer attribute is used if and only if there is src attribute. Defer is for external not internal scripts. Explanation: In async attribute, the script is executed asynchronously with the rest of the page (the script will be executed while the page continues the parsing). Defer, the Boolean attribute is set to indicate to a browser that the script is meant to be executed after the document has been parsed, but before firing DOMContentLoaded event. Older browsers doesn’t support async attribute. 6. Which of the following is used to read a HTML page and render it? Explanation: A web browser (commonly referred to as a browser) is a software application for retrieving, presenting and traversing information resources on the World Wide Web. A web server process, store and display output to client as per their request. Web matrix is a discontinued cloud-connected website builder and HTML editor for Windows. 7. Which of the following is the first web browser? Explanation: The first web browser was invented in 1990 called World Wide Web which was later renamed to Nexus. In 1995, a graphical web browser named Internet Explorer was developed. The Netscape is a web browser produced by Netscape Communications. NCSA Mosaic, or Mosaic, is the web browser which in turn popularized World Wide Web. Explanation: Sir Timothy John “Tim” Berners-Lee, also known as TimBL, is an English computer scientist, best known as the inventor of the World Wide Web. He made a proposal for an information management system in March 1989, and he implemented the first successful communication between a Hypertext Transfer Protocol (HTTP) client and server via the Internet sometime around mid-November of that same year. 9. Nexus is first graphical web browser. Explanation: Mosaic was the first browser to display images inline with text instead of displaying images in a separate window, while often described as the first graphical web browser. Explanation: On February 23, 1998, Netscape Communications Corporation created a project called Mozilla to co-ordinate the development of the Mozilla Application Suite, the open source version of Netscape’s internet software, Netscape Communicator.